As explained earlier, the cold dry air is now almost encircling the Very Severe Cyclone from the West and south. 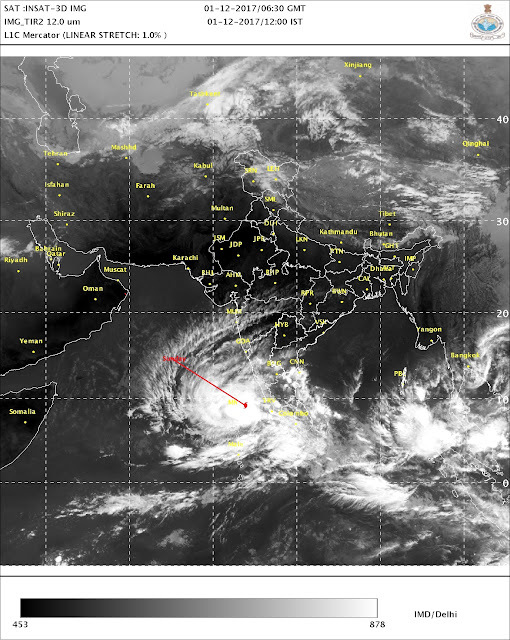 Hence, with the positioning of the STR, the Cyclone has now tracked N/NW, changed course from expected lines. Stationed at 12.3N and 68.8E, estimated core pressure is 975 mb. Core winds estimated at 135 kmph. Envoloping cold dry air, and cooler seas, will weaken the system from Monday, as it heads NE towards South Gujarat coast. Squally weather for Mumbai on Tuesday and rainy for Surat. Details of these cities and rain affected regions later tonight in next report at 12 mid night (Sunday). 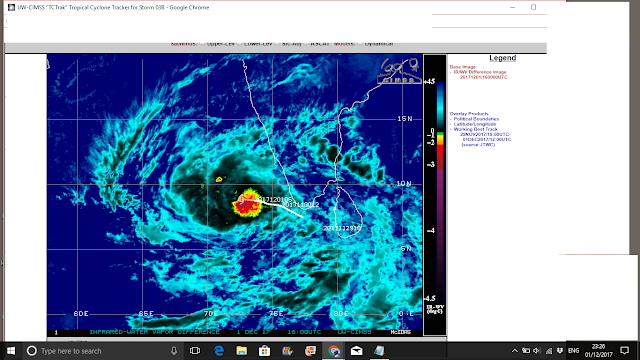 Severe Cyclonic Storm "Ockhi" is moving NW as expected, and is latest location is 11.4N and 69.4E. Estimated core winds is at 150-160 kmph and estimated core pressure (average) is 977 mb. Dense overcast clouding has filled in the eye of the storm.As the Sub Tropical Ridge persists, the system will continue to travel NW. An upper air anticyclone and drier air will start to weaken the cyclone from Sunday. As the cyclone reaches the periphery of the STR, which is at about 15N today, it may weaken more and run NE along the STR. It will encounter dry air after 16N, and the dry air has now covered the extreme NW and West and is slowly creeping into the South of the Cyclone.See Infra Red /Water Vapour Image. Cyclone will surely weaken after crossing 15N, and the hitting of land then depends on the speed of the cyclone and the weakening pace. May be a weak system if it reaches the West coast of India (North of Mumbai). Mumbai will be hazy on Sunday.Partly cloudy on Monday. Cloudy and light rain expected on Tuesday 5th . BB-19 will be forming in the South Bay by 4th December. With an expected track Westwards, Chennai can expect a good spell from this. North Int T.N.T.N. can wait for this system to give rains around 7th. "Ockhi" located at 9.1N and 72.3E having moved W/NW after last report. Estimated wind speed at core is 100-110 kmph . Will track W/NW now, moving away from the Indian Coast. The intense cloud bands in the Western and NW segment are not so prominent now. Unfortunately (or fortunately) i see that dry air is now gaining its grip in the NW and West of the system and....trying to push Eastwards towards the South of the cyclone. Will the dry air literally encircle the cyclone from 3 sides ? will the growth be restricted ? I still do not give or declare the track or strength of Ockhi beyond Sunday. I have some doubts as explained....but we take it as it comes by the day. Latest position of Cyclone " Ockhi": Located W/NW of last reporting and is situated at 8.8N and 73.5E. Estimated core pressure (average) is 981 mb, and estimated core wind speed is 90 kmph. System will track W/NW moving away from the Indian coast. Notable rainfall in Kerala yesterday: Aryankavu ( Kollam) 257 mms, Minicy (Lakshadweep) 191 mms, Myladupura (Idduki) 120 mms, Punalur 91 mms, Thiru AP 79 mms. 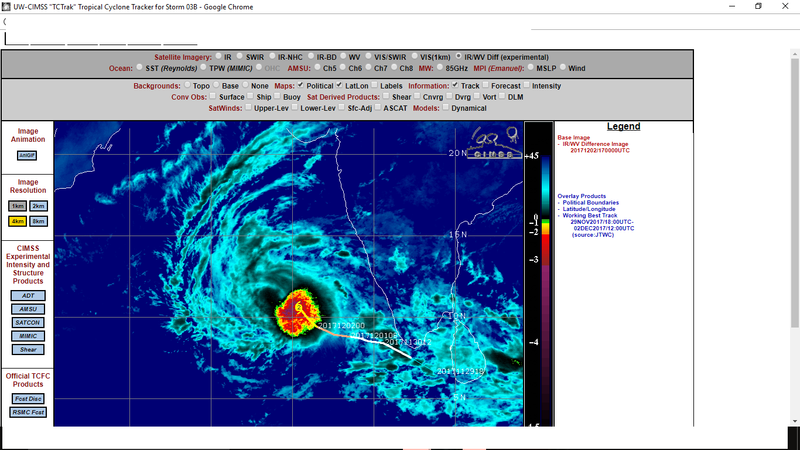 BB-15, cyclonic storm "Ockhi". Latest position as on 9.30 pm IST is 8.4N and 75.5E and estimated pressure at 995mb. Winds are estimated at 55 knts and estimate peaking at around 90 knts. Well curved cloud bands are seen around the centre, with heavy precipitation around the core. "Ockhi " will traverse W/NW now, away from the Indian coast, along the SW periphery of the sub tropical ridge. Cyclone will cross the the Lakshadweep Islands on Friday. On reaching the half stage of the ridge, if the ridge has not moved, and inter acting with the trough, it will track North-East. Unfortunately, i see a band of dry air "trying" to encircle the system from the North-west. If the dry pushes South, it will actually wrap round the system from West and could weaken it...we will wait till next 12-24 hrs. Next Vagaries report on 1st December at 11.30 am IST. Oh no.... cyclone should have crossed TN/SAP to give good rains to interiors all waiting for 3 digit rains... Unusual place neither TN or Sri Lanka got any benefit... Most recent dud cyclones kyant,Lehar,Jal... all fizzeled with no rains! But as vagaries says if this moves NE towards southern coast will good rains happen?? Is it possible for cyclone ovedr Lakshdweep to move towards GUJ/RAJ ?? GUJ rains as we know are patent - well known for 3 digits multiple days! both from AS/Bay - we had some instance of cyclone in Nov impacting NW. Thanks for the NEM update. Due to cyclone pull effect my region(Erode district,TN) received around 2 cms of rain.My town received just 8mm. Overall my district is with around 50% deficiency as on today. Usually,the rain in interior TN is less during December. Last two years no cultivation of crops, but the pre-monsoon showers given some hope.But as again NEM is playing hide and seek. Do we still have any chance of good rains? !The update will be very useful for our farming decisions.Thanks. Its cloudy hazy here in mumbai. Seems due to this cyclone in southern part. It is NEM period but cyclone over AS instead of BAY ! @sset Arabian sea cyclone has given very good rains to south coastal tn, tn ghats and delta. Agreed some parts of interior tn didnt get as excepted but impotantly south tn dams and rivers have got good flows..
Rajesh sir eagerly waiting for BB-16 updates ..
correct Narayanji - rains r required for TN/SAP before NEM ends....as u see major rice growing areas are deltas, interiors farmers are waiting for rains after miserable 2016 drought. But it is very very unusual cyclone...developed too fast and moving away too fast. Rains coming for Mumbai on Tuesday-Wednesday as system moves towards Gujarat-Maharashtra border. Hello, just wanted to say that I really enjoy your blog on the weather. The pink auroras post has been especially entertaining and informative to read. I often consult your blog when I am dissatisfied with the 'standard' weather info available to the general public. I just have one query - I live in Bangalore and I used to see regular updates for the city's forecast till a few months ago. I see Chennai, Mumbai, Pune and Delhi crop up regularly here but Bangalore is conspicuously absent now from the list of regular updates. I am quite surprised by this, and I'm not sure if you thought no one from Bangalore reads your blog and therefore decided to do away with it. If so, please know I do check your website because I haven't found anything else like it out there! I really hope you will consider including Bangalore in your forecasts and posts again soon. I have been suffering chronic health conditions for over a decade, one of which necessitated a major surgery and titanium implants into my skeleton. So each time a low pressure area or depression or cyclone forms in the BB or AS, Bangalore is affected and I end up in excruciating pain (the implants in my body seem to react strongly to an approaching weather system). I have used your blog to help me get through a few days of agony spent in bed when I cannot function at all. It helps more than you know, as I can soothe myself by saying 'only so many days/hours left and I will be pain free'. I have run into others here in bangalore with similar implants and we all suffer tremendously at such times. So it would be fantastic if you could include Bangalore once again! Especially during the cyclonic season as Bangalore's altitude creates hell with low pressure/low temperature manifesting so quickly that some of our bodies cannot adjust to it. At such times an accurate forecast helps us plan our lives (because so many of us end up stuck in bed waiting for the storm to pass). Just watching the news or checking an app (which often post wrong temperatures) is a lousy option compared to the info I get here. Thanks! Wish you a good day - J. Some models suggest very heavy rains for north MAHA/GUJ NEM cyclone snatched by GUJ/MAHA- these places are like magnet they attract all lows SWM,NEM - AS,BAY lows. CarrieHobbes (J): Vagaries will always be helpful, or try to be as helpful as possible with regards to guide or be of any assistance as far as weather is concerned. I am happy to note that you follow vagaries, and try to overcome your "dull times" with the help of this blog. As you mentioned correctly, i was not too sure of the response from Bangalore, though we do have a handful of dedicated vagarians (like Vijayanand) to name one, who give regular feedbacks. But, i will increase the Banglore coverage as and when we see any weather event approaching Bangalore. I wish and pray for your fast recovery and hope you get well soon.